Welcome to Big Ten 75.com Old Skool Music Station for your listening pleasure. This page is dedicated to the celebration of Old Skool R&B, Soul, Funk, Disco, Jazz & Etc. music that we grew up with & loved throughout the years. It is hoped that the music will take you back and that it helps you capture those lost memories that we all have. 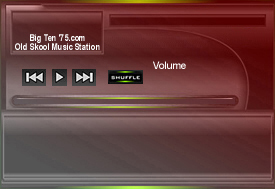 Now you can listen to Big Ten 75.com Old Skool Music Station not only on the website but wherever and whenever you’re in the mood to listen to great old skool R&B, Soul, Funk, Disco, Jazz , Etc., with the Old Skool Music Station CD sets. To check out the Old Skool Music Station 12 CD set, Love Songs 3 CD set, Kool Jazz 3 CD set, "Michael Jackson Edition" 4 CD set & Christmas Songs 2 CD set Click Here. To Listen To The Music Click On The Play Button Below! Please let us know what you think about the Big Ten '75.com Old Skool Music Station by leaving a response on our Message Board. © Copyright 2006-2016 Big Ten 75 All Rights Reserved.